Workplaces shouldn’t sleep on the importance of shut-eye. If you often find yourself nodding off during the work day, you might want to bookmark this article for future reference! As science learns more about sleep and how our brains work, it is becoming clear that well-rested people perform better. While this seems like common sense, we often forget that rest is a necessary ingredient for success for tasks from driving to decision-making and communicating to working. A few recent studies have highlighted the effects of sleep on work performance as well as potential benefits of naps, offering interesting considerations for both employees and employers. A study released last year by Dutch researchers looked at data from 1435 people procured in a previous study, the Netherlands Study of Depression and Anxiety, to find links between work performance, sleep and anxiety/depressive disorders. Researchers sought information on medical and mental histories, sociodemographics, and work habits. Participants were asked about work absences, self-assessed work performance, sleep duration, and sleep issues, among other subjects. About half of the study’s participants were diagnosed with anxiety or depressive disorders while the other half were not. People with an anxiety or depressive disorder were 2.2 times more likely to have impaired work performance. People with an anxiety or depressive disorder and short sleep duration were 2.54 times more likely to have impaired work performance and 85% more likely to miss work long-term. People with an anxiety or depressive disorder and long rest duration were 20% less likely to have impaired work performance and 17% less likely to miss work long term than those with disorders who slept normal or short durations. People with an anxiety or depressive disorder and insomnia were 2.48 times more likely to have a long-term work absence. People with insomnia were 56% likely to have impaired work performance. People without disorders who reported long sleep durations were 4.28 times more likely to have impaired work performance and 37% more likely to miss work long-term. In terms of rest affecting work, those that face the most consequences are people with depressive disorders who sleep less than 6 hours per night and/or experience insomnia, as well as people without disorders who have insomnia or sleep more than 10 hours per night. These groups are more likely to notice a decline in their work performance and to take absences of two weeks or longer from their jobs. This is not the first study to look at sleep and work performance, either. A 2012 study from Brigham and Women’s Hospital demonstrated that work performance consistently worsened the longer a sleep-deprived person was awake. The study allowed people an average of less than 6 hours of sleep per night over one month, and the participants’ performance declined each week. Disasters such as the Three-Mile Island and Chernobyl nuclear accidents, the Challenger explosion, and the Exxon Valdez oil spill have also been linked with sleep-deprived workers. For people whose jobs involve driving, several other studies have documented the dangers of drowsy driving, which are on par or even potentially more dangerous than drunk driving. 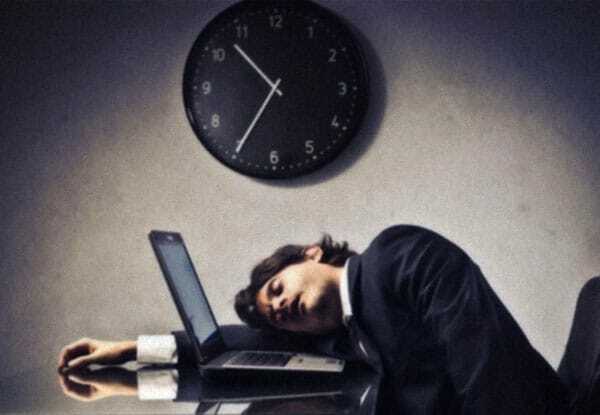 In the article, Dr. Czeisler also recommends that businesses take sleep seriously by educating workers on sleep hygiene the same way they do harassment and other policies, take rest into account when scheduling, provide sleep disorder screening, and that supervisors model healthy sleep habits. While these types of policies may not be at the forefront of most corporate agendas, the last few years have seen some promising trends. In the dog-eat-dog business world, sleep is often portrayed in a negative light, with colleagues trading battle stories of exhaustion between late nights and early mornings. However, tired employees may be less productive on the job, more likely to miss work, and pose greater liability, so this may not be the best culture to foster in the long-term. To put it in concrete terms, the Better Sleep Council estimates that sleep deprivation costs US businesses over $150 billion per year. Some companies have begun taking a more progressive approach to sleep, encouraging employees to nap or get adequate rest in the hopes their staff will be happier and perform better. The last available statistic from 2011 placed nap rooms in about 6% of workplaces, which is likely higher by now. The following companies offer special nap perks, a trend that may soon become as popular as office gyms for health-minded workplaces. Google’s campus features Energy Pods that allow employees to catch a nap when needed. Cisco and Procter and Gamble also use the sleep pods. Huffington Post offices have nap rooms and sleep pods. MetroNaps, makers of the Energy Pods, also encourage employee naps at their office. Nike’s Oregon campus provides quiet rooms for workers to rest or meditate and encourages rest. Airways like British Airways and Continental encourage pilots to rest during long flights. Ben & Jerry’s has quiet rooms and encourages employee naps. New York Times offers privacy rooms for naps or relaxation. Mattress brand Amerisleep has a quiet space in their office with an adjustable bed and memory foam mattress for employees to nap and relax. Zappos offers a dark nap room for workers. Hearst, Newsweek and Time Warner have worked with a New York sleep spa to allow workers time to rest. Yarde Metals has had a nap room for years and encourages ill or tired employees to rest when needed to avoid shift work fatigue. Rodale’s headquarters features a cozy nap room. Congressional offices are sleep-friendly, and many representatives nap or spend nights at the office. Pizza Hut’s corporate offices allow napping. Some of the biggest names in business understand that happy, well-rested workers are going to get more done and do their jobs better. By offering a quiet space, people can take a quick power nap on a break or after lunch to get refreshed or catch up on sleep without having to leave the office or hide under their desks. In articles and interviews, many of the above companies have reported positive results despite the stereotype of naps equalling laziness. Although daytime rests have long been looked down upon in American culture, several others have historically embraced the nap. For example, Spain and several Latin & South American countries traditionally have an afternoon siesta for 1-2 hours, Italy has a similar practice called riposo as do Greece and Malta, Germans traditionally practiced a midday rest which is seeing some resurgence, several Middle Eastern cultures take an afternoon break for rest, schools in China often have naps after lunch and daytime naps for adults aren’t frowned upon, and cat naps and corporate nap rooms are also common in Japan. Naps offer concrete benefits demonstrated by researchers over the last 20 years, which is why many corporate environments have begun to take notice and why the concept of a siesta has seen a resurgence in popularity in the US, Europe and Eastern cultures as well. Even if your boss isn’t inclined to outfit your office with a nap room, you can always retreat to your car, rest for a few minutes at your desk, or find another suitable place, especially if you aren’t getting at least 7 solid hours at night. Studies show that a nap lasting approximately one hour will increase productivity for up to ten hours afterwards. NASA studied pilots and found that a 26 minute nap increased alertness by 54% and performance by 34%. A 40 minute nap improved alertness by 100%. Naps have been shown to improve social and personal interactions, so well rested co-workers can make your office more pleasant. Naps combined with caffeine were found to be most effective at improving alertness and performance for night shift workers. Studies have found a 37% reduced risk of heart disease, heart failure, and death among people who nap. Stamina, mental abilities, alertness, and an elevated mood all show improvements from naps of varying lengths. The University of Haifa in Israel conducted a study showing the importance of napping to long term memory. A later study conducted at the University of California at Berkeley concurred with these results, showing that naps help the brain retain information. Though naps can be beneficial, snoozing longer than 20 minutes may cause temporary sleep inertia and grogginess, especially if you are sleep-deprived (as your body slips into deep sleep faster). Naps that are taken too long or too close to bedtime can also affect nightime patterns. Ideally, keep your daytime naps between 10-30 minutes and at least 6 hours before your bedtime to experience the most significant benefits. Power naps aside, getting enough quality rest at night is one of the most important things you can do for your long-term health and to stay at the top of your game. Here are a few good sleep hygiene practices you can employ to snooze better. Begin to prepare to relax your body and mind an hour before bedtime. Lower lights, turn off the computer and television, and enjoy a light snack if you are hungry. A warm bath, yoga, reading, journaling, or meditation are few possible wind-down ideas. Remove light sources from the bedroom. This might include using light-blocking window shades, turning off night lights (or using motion-activated ones), covering LEDs, and removing cell phones and other electronics. Many people turn to watching TV or using a laptop to get sleepy, but the light emitted can actually keep you awake and disrupt sleep cycles. If a noisy environment keeps you up, a white noise machine or sound conditioner might help. Noise block earphones or earplugs are another solution. Pay attention to the thermostat. Based on research, most people sleep best in room temperatures in the mid sixties, though elderly individuals and babies may sleep better in slightly warmer conditions. If your nose, throat or skin gets uncomfortably dry at night, consider using a humidifier, especially in winter months. If you have to open your mouth to breath, this can affect sleep quality. Do you sneeze, have difficulty breathing or experience other symptoms of allergies in bed? If so, make sure you thoroughly wash bedding every week, consider replacing pillows older than a year, and clean your mattress as thoroughly as possible (surface vacuuming for most types). Dust-mite proof mattress covers can help reduce allergens as well. Make sure your pillows and mattresses are comfortable and in good condition. Depending on the pillow material, they should be replaced every 6 to 18 months, or when they stop comfortably supporting your head and neck. Mattresses should be replaced every 7-10 years, especially when deep sagging or impressions are present or when you notice difficulty getting comfortable or you feel pain upon waking. If you have difficulty sleeping in a flat position, consider a bed wedge or adjustable base bed. Bronchial disorders, circulatory problems, acid reflux, and edema are possible conditions that might benefit from sleeping with chest and/or legs elevated. With so much to do every day, it’s easy to understand how sleep gets pushed to the bottom of the to-do list. Afterall, sleep doesn’t help us make money, do housework, get fit or improve our lives – or does it? Science is starting to show that the simple act of rest actually may affect your performance at work, your daytime energy levels, your weight and cardiovascular health, your relationships and mood, and so much more. It is hard to think of another single activity you can do that packs as many benefits as quality sleep, and thanks to scientific research, many people and major companies are starting to take notice. Whether you can get sufficient rest at night or feel best when you take a quick afternoon nap, it is clear that sleep is one of the best things you can do for your body and mind. Take a close look at your schedule and habits to make sure you are getting the best sleep possible, and next time you find yourself needing a nap after lunch, snooze without guilt knowing you are helping yourself and your work performance.